Recently my fellow blogger Franklin Manuel from BloggerMint started a new project Quanik along with few other talented bloggers. Quanik is a non profit organization dedicated to educate people about the value of self employment and blogging. To quick start with it, they have started a program “Talent Bloggers”. There are many people who want to start professional blogging but can’t afford the expenses of Web Hosting and domain name. Talent Bloggers help such passionate bloggers by giving free web hosting with unlimited bandwidth and domain name for 1 year. After 1 year the domain name will be transferred to the user’s own account. 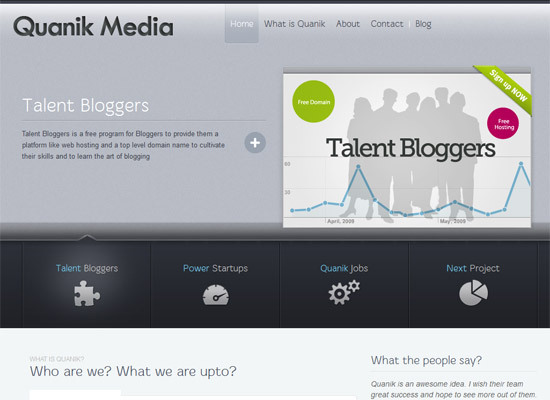 I think its a great start by Quanik team to expose the talented bloggers and to help them make money online. Currently they are accepting only 10 entries per month. You can submit your entry here to participate in the program. nice post simran .it will b very help to passionate bloggers who cant afford to buy hosting.thanks for sharing with us.. Thanks for the review Simran. Looks like they are pretty good, I like the free web hosting and domain name concept! This is really Great if i get my own website..
it’s a great start up from guys inspiring newbie’s.. they are doing a great job. good goin Quanik… I, for one could never buy my own domain until now… would have been great if they started it before….